Popol recently dropped by to let us know that he has recently graduated with a 2:1 in Business Studies. Today he is a confident and articulate person but recalls that when he started at St Charles he was quite shy and didn't have the best GCSE results. 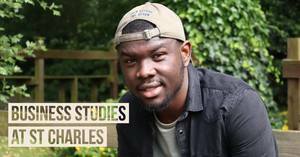 He studied for A levels in Business Studies, IT, and Media Studies, and with hard work and the support of his teachers he was able to secure a place at university. He fondly remembers Mr Alawiye’s encouragement in helping him to progress and build his confidence, and also the high expectations of behaviour and conduct of the College, 'it's preparation for the real world' he said. Popol was a member of the Student Council, and also a tutor group rep, where he learned that by getting involved he could get his voice heard and bring about change. Popol would like to go on to do a masters degree in business and then pursue a career in project management or consultancy. We're delighted that he dropped by to share his experience of St Charles and that he's now achieving the success that he has worked hard for.